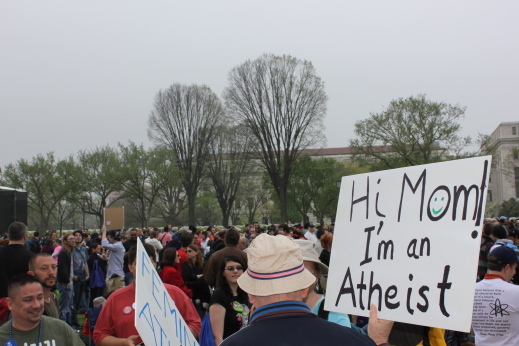 A recent large gathering of atheists in Washington, D.C. served as another sign that atheism is finding a new level of support from young Americans as well as growing influence in popular culture. The event, called the Reason Rally, held on March 24 and attended by Religioscope, also showed a new unity in the often fractious world of organized atheism and secular humanism. 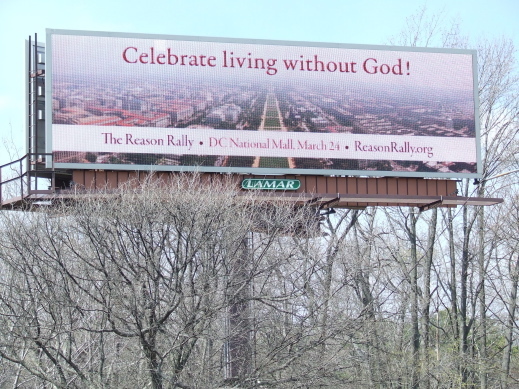 Richmond billboard promoting Reason Rally (source: Reason Rally website). The rally, which drew 10,000 people, was said to be the largest of its kind and was sponsored by 20 atheist and secular humanist organizations, ranging from American Atheists to Humanistic Judaism. The event was widely reported as a “coming out party” for atheists to publicly declare their unbelief and demand a place for themselves in American society. The call for atheists to “come out of the closet” has become a centerpiece of atheist activism, taking a leaf from the gay rights movement. 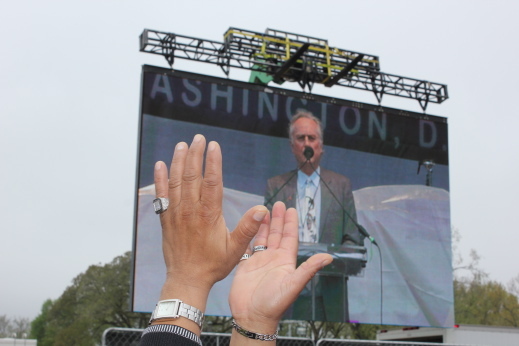 Richard Dawkins, the Oxford University scientist and “new atheist” author, told the assembled crowd that the rally could represent the “tipping point” for people declaring themselves as atheists. Richard Dawkins addressing Reason Rally (© 2012 Eddie Scott, The Skeptic in the Room – used with permission). Atheists only represent about 3 to 5 percent of the population, even if many atheist organizers claimed that the 17 percent of Americans not affiliated from religious institutions are secular in orientation. There was a large presence of young adults at the rally. This could be partly explained by the active role that the Secular Students Alliance (SSA) played in the events. The SSA has shown rapid growth in colleges and high schools, doubling since 2009 from 143 campuses to 350. But a segment of young Americans are increasingly identifying as atheists and agnostics, according to recent survey research. From 2006-2011, the fraction of Americans who reported never attending religious services rose from two percentage points among Americans over the age of 60 but tripled among those 18-29, according to the Faith Matters Survey, conducted by political scientists Robert Putnam and David Campbell. The disaffiliation from religion in segments of the Millennial generation may “now be hardening into a rejection of religion per se, and not merely of organized religion,” Putnam said in an interview with Religioscope. Between 2005 and 2011, the researchers found that the number of atheists and agnostics rose from 15 percent to 24 percent of those not affiliated with a religion. Of course, this trend does not mean that a large percentage of atheists will join the various secularist organizations; they may remain as disaffiliated from atheist groups as they were with religion. Yet there is a burgeoning presence of atheist blogs and web sites as well as a growing presence of outspoken atheists in the American arts and entertainment worlds, some of whom are connected to secularist groups. This was on display at the rally, with prominent entertainers, such as comedians Eddie Izzard, Tim Minchin and Paul Provenza and the rock group Bad Religion, regaling the crowd with satirical and sacrilegious songs and routines spoofing the pope, evangelical Christianity and other religious groups and figures. Other prominent entertainers, such as Bill Maher and Penn Jilette, were unable to attend the event, but sent video greetings to the participants. Participants at Reason Rally (© 2012 Eddie Scott, The Skeptic in the Room – used with permission). The attacks made on religion at the rally went hand-in-hand with calls for greater acceptance of atheists in politics and other areas of society. Since surveys show that a large percentage of Americans would not vote for an atheist, there was a stress on calling rally participants to get more involved in the political process and create greater acceptance for secularism. One of the first politicians to acknowledge his atheism, California congressman Pete Stark, spoke at the event. But the fact that atheists tend to take Dawkins’ advice to “mock and ridicule” people’s beliefs at most of their public gatherings may make their bid for acceptance difficult in a largely religious, if pluralistic, society.